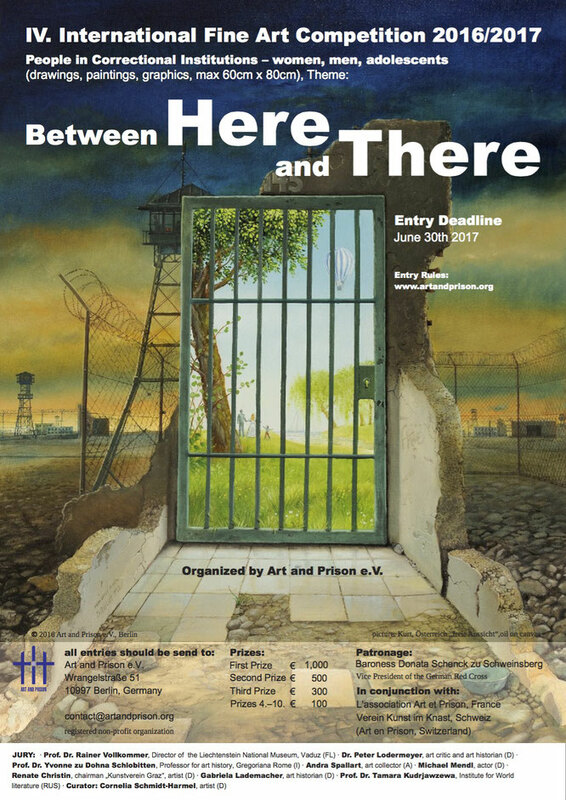 „Between HERE and THERE” is the theme of the fourth international art competition that the non-profit organization Art and Prison e.V. is announcing for imprisoned individuals. Artworks from women, men and adolescents in correctional institutions will be awarded prizes. A jury of art experts will decide the winners. The artworks entered in the competition will become part of a unique collection of „prison art“ that will be shown throughout Europe in a travelling exhibition. Previous collections were shown, for example, at the German Palace of Justice in Berlin, in the American Center for the Arts in Paris, in the Lichtenstein National Museum in Vaduz and in the Munich Palace of Justice. The art competition, the exhibition, accompanying publications and a targeted publicity campaign want to make the public aware of the realities of life in prison. encourage prisoners to engage in the creation of art and give the public the opportunities to appreciate this art. encourage prisoners to reflect on their lives through art und to use the freedom of art to create while living in conditions in which their freedom is otherwise non-existent. make the public aware of the realities of living behind bars. overcome the exclusion of prisoners through the creativity of art and bring people „inside“ and „outside“ in contact with one another, if possible in a personal interaction. convey positive impulses for personal development; promote personal interaction with other people that can contribute to security, re-socialization and reintegration into society. Art is the universal language that connects people. It can build a bridge „between HERE and THERE“. It can also signal the breakdown of communal life. It places no limit on the imagination. Through the realization of this theme, paintings can be created that help correct misconceptions and put into question prejudices. 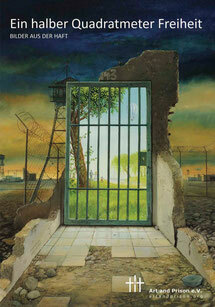 Artworks created by prisoners can change our perceptions of „good and evil“, „free or not free“, „innocent or guilty“. Societal and personal realities as well as the personal destiny of the prisoners come to light when „between HERE and THERE“ the freedom of art is filled with life and opens internal spaces that have no bars. The competition is international and will be announced in different languages. If possible, each participant will receive a certificate of participation. In the event that projected funding is realized, each participant will also receive a catalogue that documents the competition. Art Competition: Donata Freifrau Schenck zu Schweinsberg, Vice-president of the German Red Cross. Theme: „Between HERE and THERE"
Women, men and adolescents who, at the time of placing their entry, find themselves in prison, in remand pending deportation, under court-ordered supervision in hospitals or on work release, may participate in the competition. The entries must be created during this time. The entries can't have previously been shown in a public exhibition or appeared in a publication. Each participant can enter only one artwork. Drawings, paintings and graphics may be entered that don't exceed 60 x 80 cm. If possible, they should be framed or in a passepartout. Canvases must be hangable. An internationally constituted jury is responsible for awarding the winners. Their decisions are final and are not reviewable by the courts. Costs: There is no participation fee. In substantiated cases assistance can be rendered in acquiring materials necessary to create the work. Mailing and transportations costs cannot be assumed by Art and Prison e.V. - Country and name of prison with its address! Evaluation criteria: originality, realization of the theme, design quality. Jury decisions cannot be challenged in court. Participants and the public will be informed of the jury decisions. By entering an art work the participant declares that he/she has created the work and that he/she is the owner of all rights pertaining to the work. Art and Prison e.V. may display the work publicly free of charge under the name of the artist. The copyright remains with the artist in accordance with the law. The participants declare that they are the owners of all rights pertaining to the work and have the unrestricted right to utilize the work as they wish. Further, they declare that no third persons have any claims to the works and that no rights of third persons have been infringed in the depiction of persons. Art and Prison e.V. assumes no responsibility for the damage or loss of the entries. The entries become property of Art and Prison e.V., which is legally recognized as a non-profit organization and uses the donations in form of the artworks in the service of its purposes. When necessary for reasons of data protection anonymity can be granted. By placing their entries the participants accept the conditions of participation. Art and Prison e.V. reserves the right to modify the conditions of particpation. Decisions are not reviewable by the courts. We ask that entries not be made when the conditions of participation cannot be fulfilled. The decisions of the jury are final. We would like to thank the International Corrections and Prisons Association (ICPA) for communicating the art contest on the ICPA website.